Here is a short video with some tips for successful grant applications to the Ohio Historical Records Advisory Board regrant program. Assessment and Strategic Planning: hiring consultants to identify needs and priorities for improving the organization, description, preservation and access to collections. Access, Arrangement and Description: identifying, organizing, and improving access to historical records. Preservation: purchasing archival file folders, archival boxes, dehumidifiers, humidifiers, hygrothermographs, or HEPA vacuum cleaners. Website Development: Adding collections to online catalog, developing virtual archives, or creating an on-line database. Websites designed to support access to researchers (e.g., online catalogs, finding aids, and digitized collections, rather than curated web exhibits) will receive preference in funding. Grant applications are due February 28, 2019. More information on the grants, including the application packet, is available here. **PLEASE NOTE: OHRAB is awaiting formal notification from the NHPRC on the funding for the regrants. While it is necessary for OHRAB to announce this grant opportunity and begin to receive your proposals, all awards are contingent on OHRAB receiving the funds from the NHPRC. OHRAB is pleased to announce that the recipients of the 2018 OHRAB Achievement Award are the Licking County Records Center and Archives and the Warren County Records Center and Archives. The Licking County Records Center and Archives is recognized for its commitment to expanding access to Ohio’s public records. In particular the Licking County Records Center and Archives was cited for its cataloging project and its outreach initiatives, such as hosting a community scanning day and improving the reference area at its new facility. 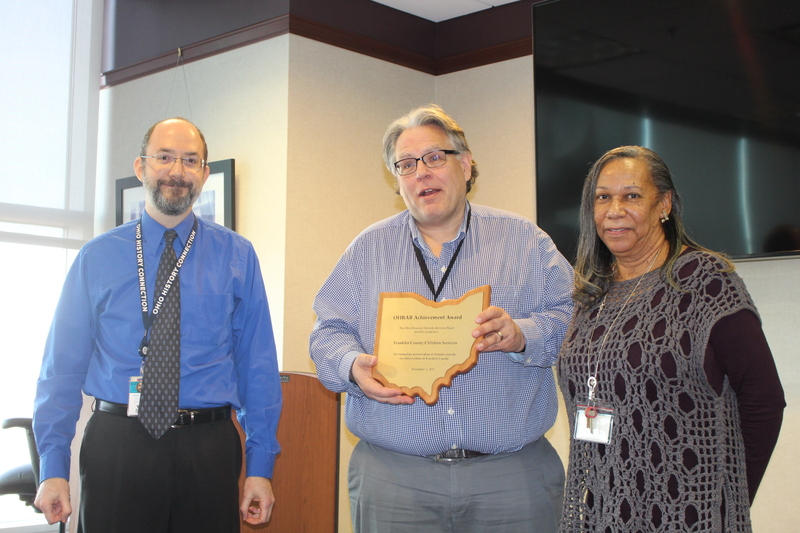 The Warren County Records Center and Archives is recognized for its work furthering the digital accessibility and the archival preservation of Ohio’s public records. By processing, indexing and digitizing records such as wills, estates, and commissioner journal indexes, the Warren County Records Center and Archives increased access to its records while preserving the original documents. OHRAB congratulates both these two institutions for their work as leaders in improving the preservation and access of public records in Ohio! The Ohio Historical Records Advisory Board (OHRAB) is pleased to congratulate students Alison Lupton, Natalie Green, Caitlan Bocks and Van Weinmann as winners of OHRAB’s 2018 Ohio History Day Awards. The OHRAB History Day Award was developed to encourage high school student research projects that demonstrate exceptional use of Ohio primary sources. Ohio primary sources are those either created in Ohio or held in an Ohio repository and represent a first-­‐hand account contemporaneous with the events or people researched. Lupton, Green and Bocks were recognized in the senior category for their website Mount Pleasant Quakers: Pacifism or Abolitionism. Weinmann won the junior category for his website The Conflict that Compromise Couldn’t Resolve: Prohibition and Its Unintended Consequences. More information on these winning projects and the program can be found on our History Day Awards page. OHRAB, with funding by the National Historical Publications and Records Commission and support from Kent State University, is proud to sponsor a FREE, unique, educational, hands-on workshop opportunity. The Greene County Records Center and Archives is bringing its educational outreach initiative to Kent State University on April 20 and giving you the tools to develop such a program in your archives and records center! When: April 20, 2018 10:00 AM – 2:30 PM, sign-in begins at 9:30 (A special behind the scenes tour of Kent State University’s Special Collections and Archives will follow the workshop for those interested). Take away an educational outreach packet of materials developed by the Greene County Records Center & Archives. In 2015, the Greene County Records Center and Archives set about creating a program, using their archival records, to engage students and educators alike as to what the archives were and how the primary sources that they held, such as freedom papers, maps, deeds, tax records and more, could enrich students’ educational experiences, teach research concepts, and bring the state and national issues that they were studying home on a local level. This program has received the 2016 OHRAB Achievement Award, the 2016 National Association of Government Archives and Records Administrators Program Excellence Award and the 2017 Society of Ohio Archivists Merit Award. Congratulations to Franklin County Children Services for receiving the 2017 OHRAB Achievement Award! Franklin County Children Services was recognized for its project inventorying and cataloging a large volume of historical records documenting the history of the agency. This included board meeting minutes, photographs, newspaper clippings, brochures and other documents. Following this project these records are now preserved and more accessible. From left, board member Fred Previts with Franklin County Children Services Records Manager Roger Hansen and Director of Data Management Kathleen Dalton. OHRAB Endorses “Value of History” Statement! The Ohio Historical Records Advisory Board has endorsed the History Relevance Campaign’s “Value of History” statement. Going against the perception that “history is nice, but not essential”, this statement shares the ways that history is crucial for ourselves, our communities and our future. More information about the History Relevance Campaign is available at https://www.historyrelevance.com/. Grant applications are due February 28, 2018. More information on the grants, including the application packet, is available here. Board member Dawne Dewey has shared the story about a young scholar who visited Wright State University’s Special Collections and Archives this past summer. Annabelle visited the archives to research Katharine Wright, sister of the Wright Brothers. The full story is available here on Wright State University’s Special Collections and Archives blog, Out of the Box.